Dupont has done it again. They’ve brewed the first true Belgian interpretation of Stout, not a simple recreation of the style. Dark, dry, and quenching as only Dupont’s incredible active and attenuating yeast can make it. 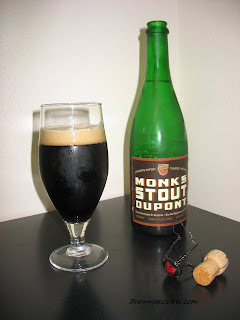 Monk’s Stout has an intense black coffee aroma with a fine bitterness. It is light, almost astringent on the tongue – like strong iced espresso. It finishes with a wonderful attack of deep roasted almost charred malt that is bracing and refreshing without the slightest trace of heaviness. Stout lovers expecting a gentler roasted malt quality or a sweet, lactose roundness that lingers on the palate will find Monk’s Stout surprising, if not challenging. But for those of us who have always found stout flavorful, but not sufficiently quenching, who like dark roasted malt, but not the lingering oftentimes coating mouthfeel now have a stout to call our own. 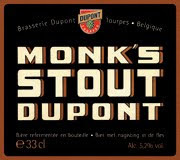 Monk’s Stout–without a doubt a truly Belgian kind of stout. - Nice super dark cola brown with ruby violet/red shading. Nice light tan fingers of head settle to a foamy thin pollow with lace sticking all about the glass. A nice pretty stout. - Nice dry bitter cocoa and coffee-like roasted malt.. not too strong as this is a mild stout. Nice clove and bready Belgian yeast touch. Not too bad, but subtle. - Subtle esters, light roasted grain with a chocolate flare. Little earthy, grassy bitter, and bready yeast. Overall a nice light drinking stout. - Rather light bodied, well carbonated, and a touch dry. Not at all chewy or cloying really. Light brew. - This is a light stout for sure, and may throw a few people off thinking that this would be some big heavy stout. It's not, but a nice simple stout with a subtle Belgian twist. I like it, I feel it is solid, and one I would drink again. I just think I would be more likely to buy it if it were on tap at a lesser price. We just put it on draft today and many expected a heavy stout and were also surprised by how light and easy drinking it was. Cheers! I rather enjoyed it, and noted the 5,2% abv when I bought it. The price on the bottle was like that of an 8+% abv stout. Where is it that you put this on draft?